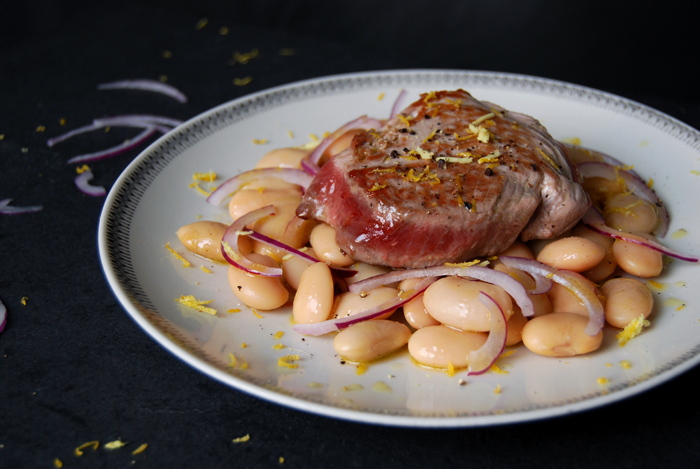 A tuna salad with white beans and onions is a wonderful light treat on a warm, summery evening, unfortunately, this is not exactly the kind of scene I find in wintery Europe at the moment. However, with a few minor changes, this dish can become something that can satisfy the needs of a cold day in January. Replace the canned fish with a fresh steak, add some warming ginger and crushed black peppercorns to it, and you’ll see it in a different way. 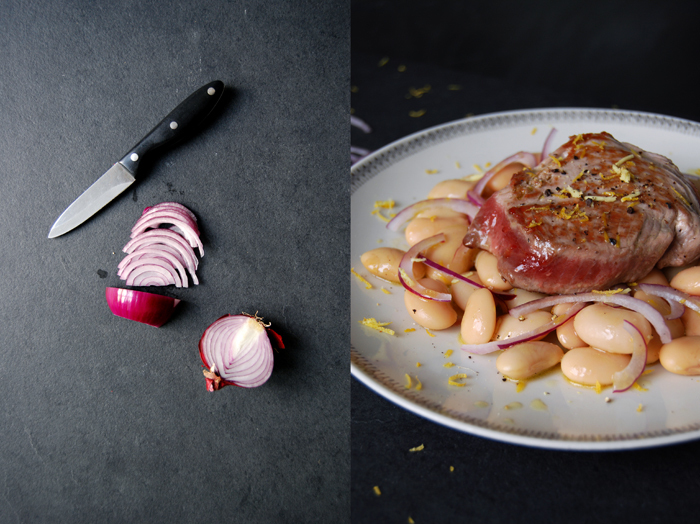 Instead of the small cannellini beans which are perfect for salads I went for a can of butter beans. The big, velvety legumes are rich and quite filling, a small plate is more than enough and you won’t feel hungry for hours! 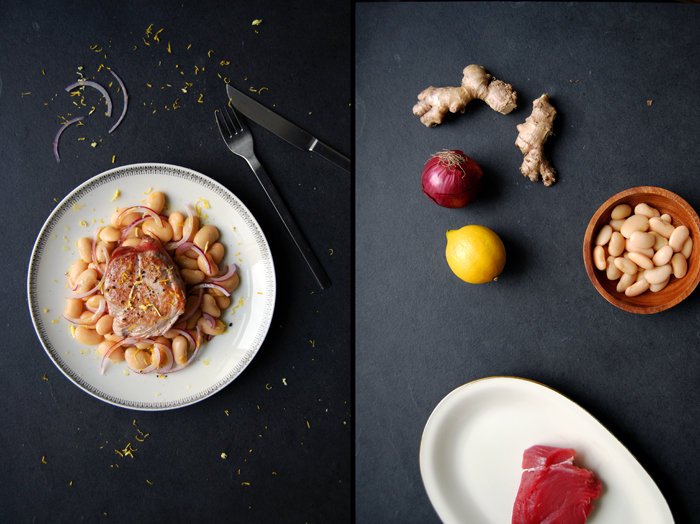 This is why I prefer them in the cold season, for hearty dishes like my butter bean and fennel soup, although they are often featured in Mediterranean summer dishes. The preparation didn’t take any longer than the salad: I seared the firm steak for just a minute on each side as I wanted it to stay slightly pink inside, if you leave it on the heat too long it becomes dry. 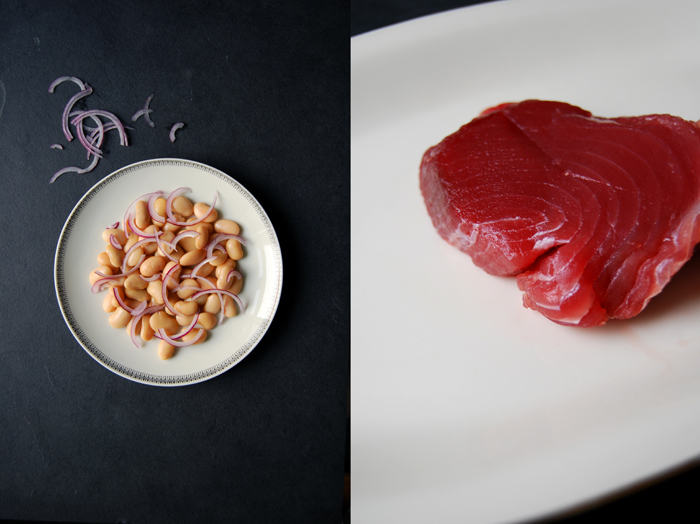 Some like to cook tuna for a few seconds to keep it completely raw but that’s not my thing, other recipes recommend finishing it in the oven for a minute after it’s been pan-seared. My piece was about 2 1/2cm / 1″ thick and it was cooked to perfection. 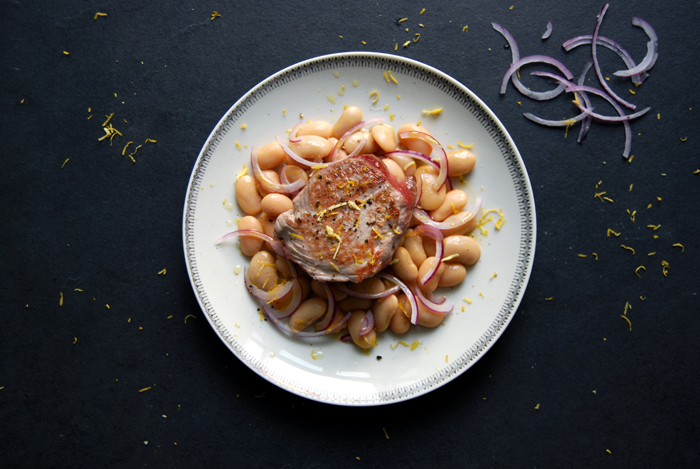 I sprinkled the tuna with freshly grated ginger and lemon zest and put it on top of the beans mixed with thin slices of red onions. The vegetables had a fruity dressing made with olive oil, freshly squeezed orange juice, white Balsamico vinegar and some of the grated root and citrus peel to pick up the aromas. It felt like a far away summer memory in a different setting which is great as long as it tastes so good! I also don’t want to miss out on telling you some great news: I’m so excited, eat in my kitchen has been featured in the German food magazine Lust auf Genuss! In the February print issue you can find an interview with me and an orange and lemon recipe I developed for the magazine with lamb chops and mashed potatoes. You can read the feature in the press section of my about page (you have to scroll down). Whisk 3 tablespoons of olive oil, the orange juice, vinegar, half the lemon zest and 1/2 teaspoon of the grated ginger and season with salt and pepper to taste. Mix the beans and onions with the dressing and arrange on plates. 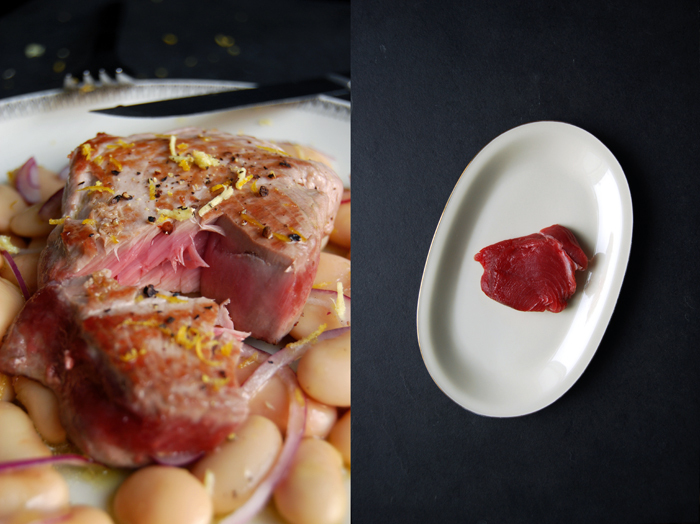 Heat a little olive oil in a pan and sear the tuna for 1 – 1 1/2 minutes on each side, the inside should stay pink. Season with salt and pepper and sprinkle with the remaining ginger and lemon zest. Serve on top of the beans. red onion = any time. all the time. you = magazine? congratulations! very much deserved!